These organic carrots are pre-cut and pre-washed - READY TO GO! I usually make these to last 3-5 days. 2-3 pounds is just as easy to make as 8 ounces is. You can also do the same thing with parsnips and/or beets, which I'll demonstrate in a future video as well. As I mention in the video, I have a bunch of variations on this recipe and will share those in future posts. 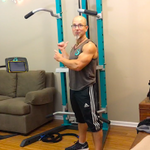 To post questions, comments or feedback about this QUICKLY-FIT recipe video, be sure to visit the Official SCULPTAFIT-Club private group zone and post in there. You already have the link bookmarked, or it is in the email that your originally received the day you became a member. Joey I saw a video a while back in here, where you were cooking a celery dish, with broth etc. I don't see it anymore, could you locate it and put it up again. I think it would be nice if you could create a space on your site that houses just your recipe videos and give us access to it so that we would not have to shuffle through the exercise videos, as great as they are, to get to the recipes. Just a suggestion. Thanks so much.